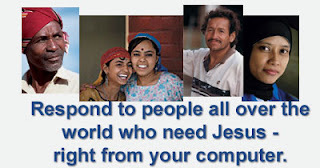 Grace Multimedia Ministry: GMM: How can I help? GMM: How can I help? Thank you for asking. There are a number of ways you can help the GMM in fulfilling it's mission of delivering thousands of Gospel CD and DVD to those who can't have access to net or afford to buy. We make it free of cost to South and Eastern Muslims. 1) Of course, you can DONATE. Finances are essential in delivering product and developing new projects - and are usually our biggest need. 2) You can ask for free copies of our CD and DVDs to DISTRIBUTE your family, friends and ministry partners. The more people use and value our resources or libraries, the more likely they will be instrumental in getting those resources to those who need them most. 3) You can PRAY! We have a email prayer list called Jumma Prayer for Muslim World and will send you our monthly news and weekly prayer concern for Muslim nations. Simply contact us. 4) You can get the word out by LINKING to our web site, There is nothing like the web community for simply getting the Word out! 5) You can email us an ENDORSEMENT or story about the use or distribution of these products which, in turn, can encourage or teach others how best to use and distribute CDs. 6) if your ORGANIZATION has excellent materials you would like to submit for inclusion in future projects, please contact us. We are currently accepting quality CD and DVD and booklets etc for Muslim of India and Pakistan. We are well enough to edit them in our local language. 1. Evangelistic/Ministry Training CD or DVD for Muslims and Evangelist. 2. Books and Tracts in Urdu or English if they are good to share with Muslims. 3. Any latest equipments using for this Ministry. See our List of Needs.. Thank you in advance for your generosity and help!